Three-pronged program to encourage mass aliyah of Jews from France. Focus on housing, jobs, education. 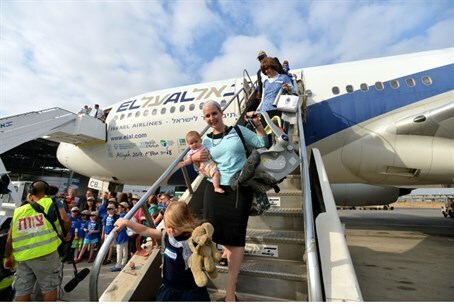 The Israeli government has been planning a new program to encourage French Jews to make Aliyah, Maariv reports Friday. The program, which will be implemented over a 3-year period, is intended to help French Jews emigrate to Israel on a large scale - following reports that French Jewry has been leaving en masse due to anti-semitism. The program will also receive state funding, according to the report. According to information gathered at the Ministry of Diaspora Affairs, tens of thousands of French Jews emigrated in 2013 to London, Canada and the United States. By comparison, just 3,000 French Jews immigrated to Israel this year. As such, the Ministry has been redirected toward increasing French Aliyah in the past several months. The conclusions of those efforts have been that strengthening French Aliyah will depend on three vital factors: finding work for the new immigrants, finding appropriate housing, and providing quality education. Anti-Semitism has been skyrocketing in France. One report revealed that anti-Semitic incidents rose 58% in 2012. Some Jews have been dealing with the problem by taking matters into their own hands. Earlier this week, 6 members of the French Jewish Defense League (known as the Ligue de Defense Juive or LDJ) were arrested on charges of tracking down - and then beating up - local Neo-Nazis. Former MK Michael Ben-Ari applauded the action, going on to call for French Jews to make Aliyah "to their only home" in a Facebook post.